Can you say, $12 a year to operate this bad boy? And, like, 95% less water used with every wash? 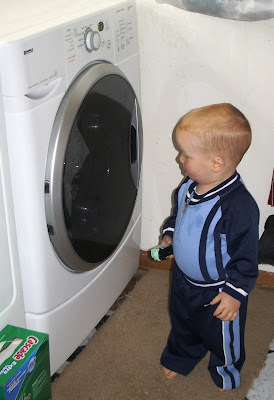 And great entertainment for my boys, who love to watch the clothes going around and around and around and around......? And quiet as a mouse, even when it is spinning at WARP speed? And clothes that take no time to dry because of said spin cycle? And the cleanest clothes I've ever seen? My pair of lovelies is sitting out in our garage waiting for my 1st floor laundry room to be finished. Maybe I'll show Ande this post and tell him when he gets my room done I'll make a post like it about him. I wonder if that would work? 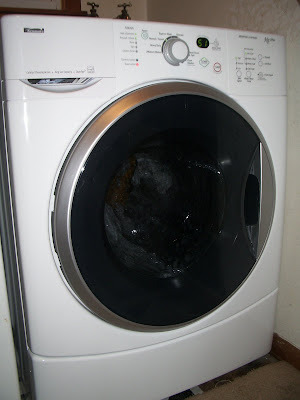 Your washer looks AWESOME!!! I'm sure with 3 boys in the house it comes in handy!! Thanks so much for your sweet comment about Livi!! That was so sweet of you to say and just made me smile!! =) And I also wanted to say GREAT JOB on your weight loss. You did awesome sticking with it and seemed to lose it pretty fast! I'm sad to say I haven't done as well, but I'm still working on it!! Thanks for being an inspiration! !